Edit: Citigroup is trying its best to ruin these results as I type this. Expect the banks to remain front and center. Looks like we'll have another action filled day. A positive intermediate-term sign Wednesday was the fact that the Semiconductor Index (SOX) rose even as the S&P and Nasdaq suffered 1% declines. I first showed the below study on the blog last August. I’ve updated the stats to run up until the present. These are solidly bullish results with the winning percentage, the profit factor, and the average trade all posting strong numbers throughout the test period. Not shown above is that over the next week the S&P has posted a close higher than the trigger day close 89% of the time. If you look out 12 days there has been at least 1 close higher than the trigger day in 42 of 43 instances (98%). The only loser came after the 7/21/98 signal. This has been a solidly bullish intermediate-term signal. I haven’t mentioned the Capitualtive Breadth Indicator (CBI) for a while. For those unfamiliar it is a proprietary method of measuring the amount of capitulation evident in the market. You may read the intro post here or the entire series here. Since the November lows it has been pretty much dormant except for a quick blip in January. It began to move up last week and at Friday’s close it hit 7. Long-time readers will recall that this is a level where I feel a decent bullish edge exists. Below is a chart of the CBI from the Quantifiable Edges members section. 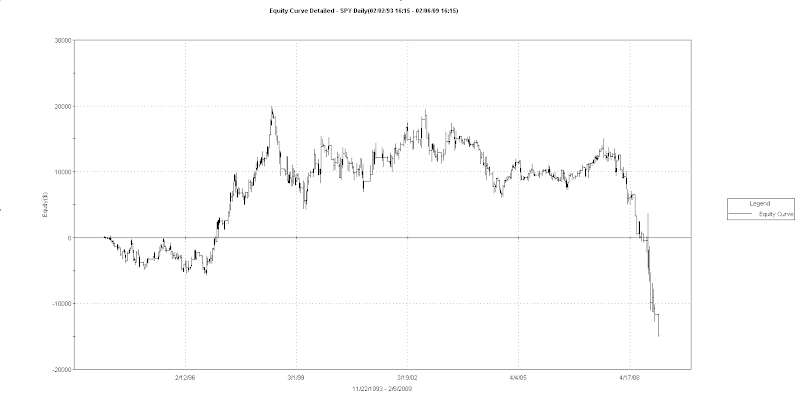 In the past I’ve demonstrated that it can be used as a market timing tool for swing trades. One “system” I’ve shown here on the blog is to purchase the S&P 500 when the CBI hits a certain level (7 being one of them) and then sell the S&P when it returns back to 3 or below. Below is an updated performance report of the above “system” covering 1995-present. I'll keep readers informed of significant changes in the CBI over the next several days until it returns to neutral. 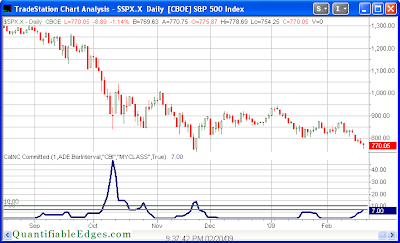 Short-term oversold at intermediate-term lows can be a powerful combination. Let’s look at the current situation. The 2-day RSI of the SPX closed basically right at 2. The SPX also closed at a 50-day low. Below is a test that shows how this combination has performed since 1985. We see here a strong inclination for an almost immediate bounce. The edge is very short-term though as it begins to dissipate after just 2 days. Not seen in the table above is that an astonishing 30 of 31 instances closed higher than the entry price at some point over the following four days. The only failure was on March 25, 1994. In the past I’ve found that weak bounces after strong selloffs have had bearish short-term implications. Wednesday’s action just missed the weak bounce as the S&P finished marginally lower. So tonight I looked at S&P performance following a sharp drop and then a marginally lower day. Below I show the 5-day return across a spectrum of possible % declines between 0 and X%. Rather than the bearish results found when the market undergoes a weak bounce, we see here that limited additional selling carries a bullish expectation over the following week. The edge remains fairly consistent regardless the level of decline between 0% and 1%. 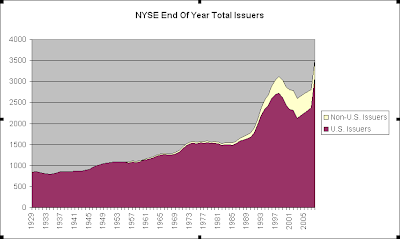 A little difficult to see is that the total issuers peaked in 1930 and declined until 1934. The market bottomed in 1932. The next true bull market didn’t emerge until 1942 though. (The 1942 Dow low was at 1933 levels.) Issuers crept higher for 8 years before the next great bull market environment emerged in 1942. 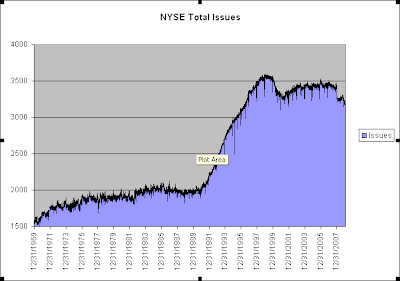 When that bull market emerged the pace of increase in new issuers did also – confirming the rapid economic expansion. *Note that the breakout of U.S. / Non-U.S. was not available until 1956. It’s been a couple of weeks since I wrote “Stops – When Not to Use Them”. In that post I suggested that using stops when trading mean-reversion systems hurts performance in the long run. There were many good comments left after that post which I will address in the next post on this subject. Today, though, I’m long overdue to tell you when I think stops ARE appropriate. While stops do not work well for overbought/oversold trading, they DO work well with breakouts or trend following systems. Traders that buy on a pattern breakout do so because their analysis indicates a trend could emerge in the stock or security they are trading. A reversal back into the base or below it would invalidate the pattern from a technician’s standpoint. Therefore in such cases I believe a stop is completely appropriate. Once the pattern “fails” you should no longer be in the trade. Of course some people may want to give a little extra leeway rather than putting a stop right at a support point, but even so, there is a point where the breakout simply didn’t take. For my own breakout trading I tend to use very tight stops. I also tend to show little patience for a trade to work once I enter it. Most successful breakouts have a tendency to work right away, and when the market environment is conducive to breakouts there’s just no point in sitting around with dead wood. I’d rather exit with a small profit or loss and try the next one. The edge in breakout or trend trading is not in the winning percentage. It’s in the risk/reward. A big winner can gain several hundred percent if it goes on a tear. That makes up for an awful lot of scratches and small losses. As an example in 2003 I did a lot of breakout trading. Cup & Handles, Flat Bases, High Tight Flags, Double Bottoms, etc. – all based primarily on daily bars. It was a tremendous year for trading breakouts because the ones that took caught fire rather quickly. It was also one of my best market years. Yet at the end of the year I went back and tallied the percentage of breakout trades I took that “worked”. In other words, they did better than a very small gain or scratch. My success rate? A little under 15%. And it was a great year. Why? 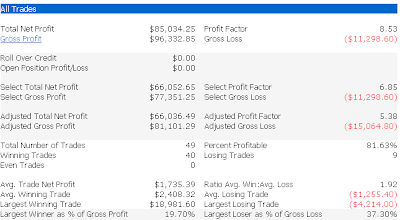 Tiny losses and massive gains. Everyone’s style is different and someone with more patience would likely have had a better win rate, but the win rate wasn’t important. What was important was controlling the losses, and one way to do that was through the use of stops. Also, for some (much) older discussion on trailing stops you can check out my “Double Support Trailing Stop” concept. So what typically occurs after strong selloffs like we saw Tuesday? When considering the potential influence an individual bar may have on future bars it is important to consider the positioning of the bar we are studying. A sharp selloff coming when the market is extended up has a whole different meaning than a sharp selloff when the market is extended down. Let’s first look at the current situation to see what I’m talking about. Here we see the sharp 1-day selloff has typically led to a muted bounce that then rolls over to make new lows. Instances are a little low. When I loosened them to a 2% drop I saw the same pattern. Here we see a sharp initial bounce that is followed by more upside. In this case the sharp selloff is possibly exhaustive. That's not the case when coming off a top. The expectation turns from negative to positive based on where the sharp selloff is occurring. So remember, when considering the meaning of a bar or pattern or of bars it is also important to consider the positioning. The January barometer is a well known study that is often referred to. It states that “as goes January, so goes the year”. In other words, if January closes down, there is a good chance the entire year will close down. Of course the bear case has a head start. I decided to eliminate that head start and look at performance from the end of January forward. Below performance is shown from the end of January to the end of the year. I used the Dow Jones Industrial Average from 1920 – today. Dividends are not taken into account. What strikes me here is that wins and losses are almost dead even – for all 11 time frames. When considering your trading approach from now through the end of the year I wouldn’t worry too much about January’s performance. SPY is nearing a 2% gap down this morning. I performed a study back in October which looked at the tendency of the SPY to close above its gap opening at some point in the next few days after such a large gap down. Below I have updated that table with the 7 additional instances that have since occurred. The edge remains squarely bullish.